Md Lutfor Rahman was born in Rajbari (Kachari para, Pangsha), Bangladesh. He received B. Sc and M. Sc in Chemistry from Rajshahi University. Later he obtained PhD in Polymer Chemistry from University Putra Malaysia on June 2000. After long service in Malaysian Public Universities, currently Dr. Lutfor Rahman is working as Associate Professor at Faculty of Industrial Sciences and Technology (FIST) of University Malaysia Pahang (UMP). Meanwhile he was worked on liquid crystals under Professor Carsten Tschierske at Martin Luther University, Halle, Germany with DAAD fellowship in 2003. His current research interest is the synthesis of novel bent / disc-shaped liquid crystals polymers having azo chromophores which can be switched optically and convert to optical storage devices. Some LC nanomaterials are can also be used as aligning layer for liquid crystals display for future generation. His liquid crystals group at UMP comprises with a senior academician Prof. Dr. Mashitah Mohd Yusoff and several academic staff including Dr. Gurumurthy Hegde and Dr. Md. Shaheen Sarkar. His research work is inspiring by Dean/ deputy Dean of FIST including numerous faculty staff. 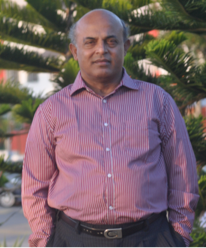 He has active collaboration and frequent visit with liquid crystals research group headed by Professor Sandeep Kumar at Raman Research Institute (RRI), Bangalore, India. His sincere thank goes to H.T. Srinivasa and K.N. Vasudha for supporting a plenty of aspect to the LC research. The texture was captured at 156°C using 200 µm scale with a 10X objective in Olympus BX51 polarizing optical microscope equipped with a Mettler Toledo FP82HT hot stage and a FP90 central processor unit having Olympus DP26 digital camera. The bent-core azo compound consists of even number of alkyl carbons in each alkyl chain with terminal double bonds. The texture obtained on slow cooling from the isotropic liquid, the B1 phase grows as dendritic texture which is recognized as columnar rectangular structure determined by X-ray diffraction. The X-ray diffraction pattern of the B1 phase is indicative of a two-dimensional rectangular lattice. Jury comment: Have you seen such colorful leaves in one picture? 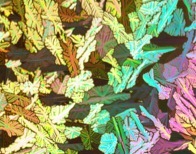 Columnar rectangular structure of liquid crystal shows the amazing texture to us! Enjoy it!